He's the "velvet voice" playing in your head deep into the night. Smooth and articulate, without anger or accent, talk show host Jeff Rense, 69, serves a six-hour smorgasbord of Jewish conspiracies, government-sponsored space alien abduction reports and an odd mix of New Age insights to tens of thousands of Internet insomniacs every weekday night. Starting at 10 p.m. Eastern time and live for the next three hours, Rense is an expert interviewer and probably the most empathetic listener in all of talk radio. He's never rude. He never interrupts. And he seldom voices even the slightest hint of skepticism with his often weird, sometimes creepy call-in guests. Rense is especially patient and kind when talking with confused, elderly visitors. Jeff will let them talk for as long as they like, sharing their stories with his audience like they were all part of some live, nationwide group therapy session. Some form of therapy might arguably be in order. Guests and visitors to Rense.com complain about their cancer being caused by government "chem trails," for which Rense sells a cure, or they may share their "recovery" from Post Abduction Syndrome (PAS) after being repeatedly kidnapped by space aliens. They might discuss the psychic powers of "remote viewers" and their discovery of underground UFO bases, or their personal sightings of mind-controlled "reptilian" supporters of the Illuminati. Though the show sounds strange and oddly comical, pandering and providing goods and services to an aging population of mostly white, postmillennial conspiracy cranks is one of the fastest-growing cottage industries in America. It's complicated and not an easy business to break into. With hundreds of finely woven threads of explanation, followers basically allege the "lies" of the establishment are intended to deceive and enslave them. And to the conspiracy theorist, it's all lies. They argue science, medicine, politics and economics are "controlled" by a monolithic force bent on the destruction of the people of the United States and the world. And if you disagree, you are either brainwashed or "one of them." Generally considered whimsical and harmless, conspiracy theories are the coloring books and crayons of adult illiteracy. The crazy is in the how and the why. And the who. Adherents are divided into distinct, often bickering, subcultures by the claimed identity of the alleged evil-doers. A look at a few of the links on Rense.com reveals some blame Obama, or bankers, or Jews, or space aliens somehow associated with the Pentagon. Rebranded "truth seekers" shortly after 9/11, the conspiracist subculture is now called the "truth movement." Since at least the late 1990s, Jeff Rense has been in the business of reaching, influencing and monetizing that movement. And business is good. 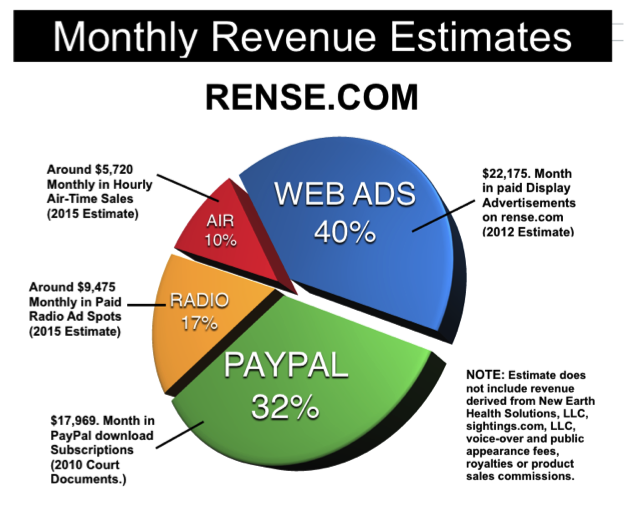 An analysis of the available anecdotal online financial data suggests Rense.com probably rakes in more than $55,000 a month. 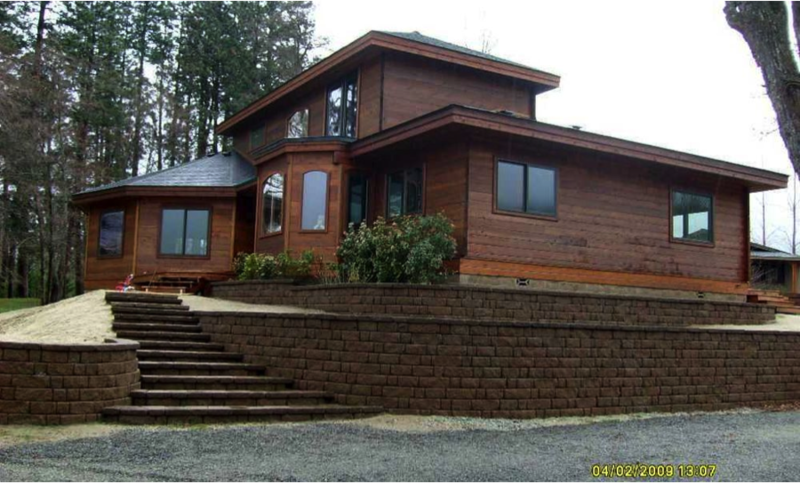 Based out of Ashland, Ore., Jeff Rense owns a custom-built cedar home on five acres, valued at more than $700,000. From his home studio, 24 hours a day, the latest, hottest conspiracy theories are presented and played in a sequential rotation on Rense Radio like pop music singles on a Top 40 station. And the Velvet Voice can sell some crazy. Soft-spoken, smooth and relaxed, Rense outlines the latest global outrage while sounding like a stoned, aging baby boomer describing how he makes candles at his kitchen table. No rage. No paranoia. Just slow, perfectly paced, almost lyrical declarations patiently explaining the global Zionist conspiracy to Grandma. The fringe conspiracy theory market seems to have evolved over the years. It's not all about suffering and space aliens at Rense.com these days. All last week, for example, while many Americans were celebrating Earth Day, Jeff Rense and company were celebrating Hitler's birthday. There was even a cake. Transitioning from aliens and alternative health to advocating anti-Semitism and monetizing hate, Rense.com seems to have gone almost "full Nazi" in 2015. Many of America's most notorious professional racists and anti-Semites now call the network home. Some of the more prominent, including David Duke and Stormfront's Don Black, have their own talk shows on the Rense Radio Network and about a half dozen more, lesser-known, hate mongers and anti-Semites run banner ads or are regularly featured guests on the various programs offered. The transformation has not exactly been subtle. A word search of the front page of Rense.com on April 23, 2015, provided eight results for the word "alien," 11 references to "health" and 16 uses of the word "cancer." By comparison, "Hitler" was mentioned 21 times. And always in a good way. Contrast these themes with Rense back in the day. A site grab of Rense.com for Feb. 29, 2000 from Archive.org shows nine references to the word "UFO," six hits for "chemtrail" and not a single mention of "Hitler." Considered one of the most market-savvy operators in the fringe business, Rense may have cynically decided to offer content to the white racist movement in an attempt to expand his business by exposing a new audience to his advertisers. He might want to rethink that strategy. Rense.com has lost more than half of its audience in the past year, according to Alexa, with a measurably precipitous drop in September and again last January, the one year anniversary of Stormfront Radio appearing on his network. Run by former Klansman Don Black, the two hour show starts at 9 a.m. Eastern and is followed by another former Klansman, David Duke, for the next hour. But there appears to be something more going on with Jeff Rense than just "test marketing" to hatemongers. He at least seems to sincerely believe much of what the professional anti-Semites are saying on his network. Some of the most vile Jew haters in the world have appeared on his radio show and his supportive statements and off-the-cuff comments suggest Rense is baiting and bashing Jews for reasons of his own. Not much is actually known about Jeffrey Shearer Rense, the founder and proprietor of Rense.com. It's unknown how old he is or what he even looks like. He has refused repeated requests for an interview. Critics claim Rense was born in 1945 or 1946. An Oregon Marriage License found online states his date of birth is January 30, 1946, making Rense 70 years old in a few months. An airbrushed photo of a 40-something-year-old man with a head full of frizzy, permed hair is featured on his website, proudly captioned "Jeff Rense, A National Treasure." Much of the available online information about Rense comes from critics, former wives and disgruntled former business associates. These graphic and often embarrassing disclosures don't usually stay online for long. Rense evidently uses high-priced attorneys to attempt to silence his detractors. There is a more current photo online of an almost cadaverous-looking Jeff Rense (right). One of his reported nine former wives, Melinda Jane Kellogg, (number 7) posted a 2010 wedding picture of the two of them. Her website is now heavily edited, after what she says were legal threats, with most references to Rense removed, though much of what was deleted remains available on Archive.org. Records on file with the state also list all of these entities as "inactive." Perhaps not surprisingly, when preaching to this crowd, there really isn't a lot of truth presented by the leaders of the "Truth Movement." In fact, the most common theme articulated by self-described "truth seekers" is that there is a conspiracy and someone–maybe everyone–is lying about it. Promoting memes of universal doubt and distrust in just about everything imaginable is not without its benefits. If the target audience can be convinced they are "being lied to" by the system, and should therefore no longer trust the government or any other institution in society, they become gradually susceptible to a new kind of "truth." And it usually involves their credit card. The alternative reality presented by the professional "truth seeker" typically involves monetizing alternative solutions to the everyday problems of the target audience. In the conspiracy-based, overnight talk radio show business haunted by Jeff Rense and company, the demographic is usually elderly, homebound and easily-swayed. Following the money trail, Jeff Rense, along with many of his network sponsors, appear to mostly specialize in marketing notoriously fraudulent alternative health care products to older people with chronic or terminal illnesses. The soothing, confident Velvet Voice sells them hope. Five of the six main advertisers on the Rense Radio Network offer alternative health care products. "The Best of the Best" of these medicines and devices are also sold on Rense's Web-based storefront, New Earth Health Solutions. One of the most heavily-advertised health care products on the Rense network is also the most expensive and probably the most profitable. 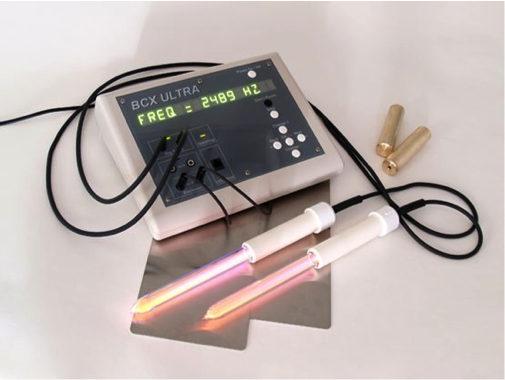 The "BCX-Ultra," offered through Rense's New Earth Health Solutions page, sells for $2,695 (with free shipping). Payments are accepted and processed via PayPal. The sophisticated-looking contraption is said to be a "Rife Resonant Frequency Generator." Jeff Rense does the commercial voice-over himself, identifying the inventor, Royal Raymond Rife, as "the most gifted scientific medical genius of our age"
"By exposing disease organisms to highly-modified forms of their own unique frequency, viruses and bacteria can be eliminated by the millions leaving healthy tissue unharmed. Validated by nearly 80 years of research, this technology can be used for experimental research purposes on pathogens and other metabolic deficiencies like Arthritis, Fungus, Virus, Candida, Migraines, Infections, Herpes, Lyme disease, Depression, Kidney Insufficiency, Lupus, Fibromyalgia, Chronic Fatigue, Liver Congestion & many other conditions." The online offering also claims the product can "Charge your body and cells with the right frequency and you can prevent disease. Why wait?" On the same page, Rense posts a link to an article purporting to show that scientists have used Rife Resonant energy to kill viruses. Elsewhere on Rense's website, claims are made that Rife Generators cure cancer. Another article claims the same thing. In fact, there are 451 references to Rife on Rense.com. "Consumer stated that he purchased an electronic machine known by various names which include 'energy wellness', 'frequency wellness instrument', 'rife machine', 'rife generator', et al. He bought the machine because it was touted as a cure for hiv-aids; as well as disease. Sales person told him that the machine was a 'resonance generator', and it would kill 'pathogens and organisms.'" Perhaps more relevant to Rense, however, are two other references to Rife Generators on the FDA's medical fraud pages. A California man, James Folsom, was sentenced to 51 months in prison and fined $250,000 in 2010 for selling Rife Generators he had advertised as a cure for a variety of diseases. Another California man, Randy Frager, was ordered to pay a $100,000 fine after pleading guilty to selling a similar Rife resonant frequency device online. The Southern Poverty Law Center has contacted the FDA for comment regarding the materials Rense and his advertisers sell. Documented evidence of medical fraud can be found throughout the constellation of conmen promoting health care products on the Rense Radio Network. 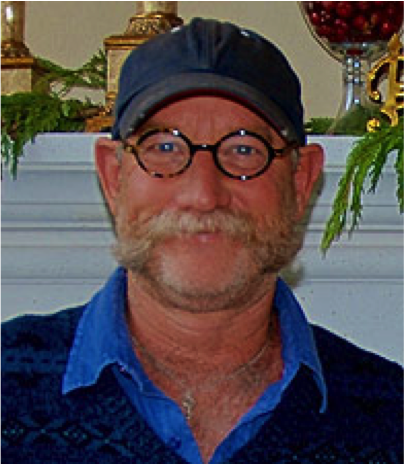 Joel Blake Sawyer, 61, has been one of the most influential advertisers on Rense Radio and Rense.com. Jeff Rense has had him on his show repeatedly, where Sawyer talks about being a "truth seeker" while discussing his research on curing cancer. Sawyer's "Royal Velvet" product, which is advertised as "pure deer antler extract," sells for $65 for a one ounce bottle and claims to address dozens of health issues, according to the website, "including reversing the aging process, dramatically improving athletic performance, boosting brain function, repairing your DNA and damaged organs, improving overall health, weight, sleep, libido, blood sugar levels, cardiovascular system...and more!" Again, the FDA is evidently well-aware of Sawyer and Royal Velvet. According to the medical legal case monitoring site, Casewatch, Joel Blake Sawyer was warned by the FDA about representing his deer antler product as a health remedy more than a decade ago. More information about Sawyer can be found at Quackwatch. In an interview with the SPLC, Sawyer said that although he did have to remove a website several years ago at the insistence of the FDA where customers claimed various health benefits from Royal Velvet, all of his claims about the product now have scientific backing. When asked about advertising his product on a website filled with anti-Semitism and radio shows put on by Klansmen, Sawyer said he was acting in the vein of Jesus by talking to Rense about anti-Semitism. 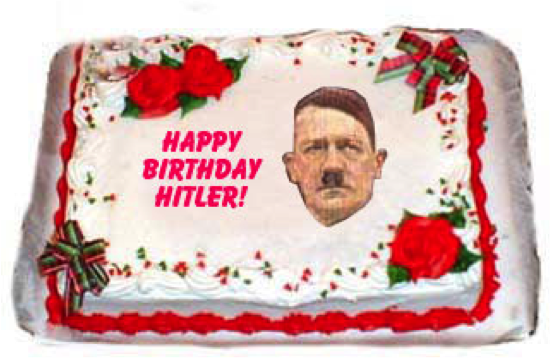 When asked specifically about the fact that Rense.com celebrated Hitler’s Birthday on April 20, 2015, Sawyer told the SPLC “you do not know what is in my heart” and that he had talked to Rense about these issues. Another Rense Radio and website advertiser, Carnivora Research International, sells a product represented as an extract from the juices of the Venus Fly Trap. The website claims the product "Selectively Responds to Abnormal Cells" with "No Harm to a Single Normal Cell." A one ounce plastic bottle of Carnivora sells for $44.95 plus $6.95 shipping. The company asserts the formula for Carnivora was discovered in the 1970s by a German physician, Dr. Helmut Keller. For the elderly prospective consumer, the Rense commercials and the website also claim that, while still in office, former President Ronald Reagan was the first user of Carnivora in the United States "for an advanced immune challenge." "Carnivora supplements mimic the body's own defense agents and support a stronger immune reaction. The supplements, developed by Carnivora Research Inc., International, maintain the carefully balanced immune system mechanisms." 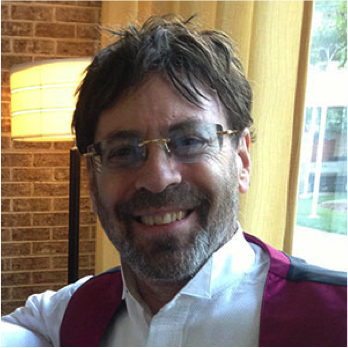 In an interview on Extreme Health Radio in August of last year, Carnivora CEO Richard Ostrow complained bitterly about agents with the FDA coming to his offices in 2013 to investigate his company and the claims he was making about his product. "...these unapproved drugs are ‘double’ invoiced in that the external/visible invoice for these items misdeclares them as vitamins, Nectar or juice, but another invoice packed inside the shipping boxes identifies the true nature of the products. These shipments are of non-commercial size and appear to be for personal use. Accompanying the drug shipment is a protocol that includes the dosage and treatment schedules. This document states that the drugs are ‘proven safe and effective in the treatment of cancer, chronic diseases and HIV infection in man.’ Fraudulent promotion by these means is evident." There is a reprehensible segment of the "alternative health" industry that profits by preying on the sick and dying, the vulnerable and confused. They don't advertise their products in health journals or magazines. Instead, they push their pills, extracts and blinking-light contraptions to the poor and poorly educated segments of the conspiracy subculture, where the audience awaits word of government oppression every night. For alternative health products, the "truth movement" is a predator's playground. The paranoid audience has been preconditioned to believe any truly effective medicine will be targeted by the evil "they" who will rush to get it off the market before every doctor in America is out of a job. As a result, allegations of fraud or FDA intervention against an alternative health product vendor targeting this community often accelerates sales. Anticipating impending removal, there is a greater urgency to buy the product now, before the FDA sweeps in and seizes the magical remedy and shuts the operation down before the rest of America learns about it. FDA investigators call it "the long con." Even after the government successfully intervenes to prevent a medical fraudster from preying on the public any further, the conspiracy community will continue to support him. Jim Folsom, for example, the man convicted of selling Rife machines in 2010, still has dozens of support sites and a detailed summary of his case on the rifewiki website. Thus, any smooth seller of snake oil can get on the air and share his secret knowledge with an audience that already believes that any and all breakthrough discoveries are going to be suppressed. Call in and question his assertions at your peril. Challenge the "truth seeker," dare to disagree, and you will be immediately discredited as "one of them." That's the advantage of claiming exclusivity on the truth. When the audience is conditioned to believe in the malevolence of “The Jew,” aliens and orbs, conspiracies and cover-ups, the government is always evil and the conman is king. And the confused, elderly guest will continue to be allowed to tell her long story without interruption on the Jeff Rense Show while the Velvet Voice gently leads her and tens of thousands of other sad, scared and lonely listeners off into another world, deep in to the night.